Hey guys i am 3 weeks post my phenol peel. It got rid of many scars and my texture is better but i think it had left my with scarring! I dont know if its just normal wound healing but my doctor can't see me until friday. I think he did something wrong but will not admit it. Here is a picture of the right side which is not the only spot i have this weird kind of texture. Looks like the scarring, which Retin-A left on my skin... Ask the doctor, I am quite curious, what will he tell you. Retin - A does make Scars?! Thats quite interesting, because i did use retin - a the last few days. My doc said its safe to use now. But i think it did worsen the spots. Do you have still the scars? If it's starting to become raised and increasingly red, that is a probable sign of scar formation. That's not meant to freak you out, but you should definitely see your doctor for it. I think most doctors would prescribe you a topical steroid to calm the inflammation. I'm curious how you decided to do the phenol peel. Not many people get these nowadays because they're so aggressive and unpredictable in terms of how deep it can go. Hope you hell well. Depends on people I guess. I had NEVER scars before I used Retin A. From a few months of having acne - bam! My face is covered w it. 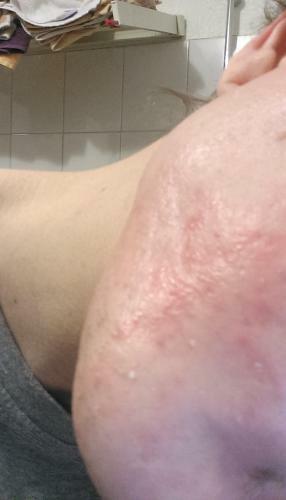 My dermatologist asked me, If I used Accutane, when I said no, she warned me not to ever use it, as the new study claims, that it causes new scars. It contains Isotretinoin, so as RetinA... I know some people had success with it, but some were left with permanently damaged skin. What is this new study? I'd be interested in reading about this. Well i think the redness is better than last week. Also today its less red than yesterday. But i used avene cilcalfate on the spots. Sometimes it looks like a healing process or a slight infection. Last week i went to my dermatologist because i thought my doc did something wrong. She said that's the normal healing process and no scar formation. But i dont know if she was right...she is new and young. My old dermatologist was'nt there at this time. I guess i have to see her. When she is saying that is no scar formation, i believe that's no scar formation. But my gut feeling say's she would prescribe me a antibiotic ointment and a steroid cream. Well i saw many reviews on realself and they looked great. I did some research that it is the deepest form of peel and can help with scars more than a tca peel. But i really think the doc did something wrong. On one side he frosted more as on the other side. My face startet to peel very soon on the light side and after days the other side began. Also i find the result is not the best for a deep phenol peel. Its a good result, like i have less skin laxitiy and tighter contour and scars are less visible but i think my old dermatologist could have reached this result too with a tca peel. Well i guess that's my fault because i went to a cosmetic surgeron. I defenetly won't pay the full price for the phenol because he defenetly did something wrong. Also i had no pre and post care advices. I'm very angry. Well accutane did the same to me. I had more scars on accutane as before. I just wanted to push the collagen production and prevent future acne. But if this makes scarring too, i would like to switch to another treatment for my goals. Do you have any suggestions? Ummmm I've used Retin A every night for 10 years and I was fine. Helped my skin break out less. What's this study? I'd be curious to read this, as this sounds pretty extreme. I can't imagine retin-a would be able to ablate 100s of microns of skin. As I said, this is what my derm told me. I can ask her for more information. She didn't say anything about Retin A, she was mentioning Accutane. I used Retin A for over a year, I broke out with cysts and they left scars. Then I stopped. When I had a cyst on my face, it didn't leave a scar. Then I switched to Epiduo. I used it for 2-3 months - cysts left scars. Plus my pores were huge and texture shiny and horrible. I stopped with tretinoin treatments and I had no new scars at all, even from the worst cysts. I don't want to force anyone into my opinion. I just share my experiences. Maybe I am one from thousands... but it messed my skin, so just be careful. I also realised, that peels don't work for me. Pores are getting bigger and texture worse. Redness disappears, but it's not worth for me. I hope so. But i dont know what to use for topical. My collagen production is very low due to stress and stuff, and i would like to increase it with topicals. But i can't use any retin-a or aha stuff as long as i dont know what this red areas are. It looks really horrible! Well it seems like that the most acne patients tend to have low collagen production. My best firend is 31 and a cosmetician. She also had acne and her skin feels the same as mine. It's not as tight as on normal persons with normal skin. If i dont get a good amount of sleep, i will look like a drug addicted. My skin becomes loose or kinda saggy. Today i will see my doctor and i let him know, that i am not suprised and dont want to pay the full price. I talked to my lawyer and she said i can do that. My whole face is covered with red stripes and those nasty patches like in the picture. I hope this will fade and not scar me. I have to start work in 2 weeks. Im so afraid of being outside all the time because of the sun and dirt. I just came back from my docs office. It went out good so far. He said that this patches are not scarring. It's skin that heals. Also he said, its safe to do a second peel and i dont have to pay for it. He will do a lighter peel to get rid of the red areas ( he will fade it out to the surrouding area) . And the areas on the picture are less red than on the day i took the picuture . I think that's because i use thick layers of cicalfate on the areas.